But the Lord said to Samuel, “Do not look on his appearance or on the height of his stature, because I have rejected him; for the Lord does not see as mortals see; they look on the outward appearance, but the Lord looks on the heart” (1 Samuel 16:7). “I’ll be a dentist…” (line from Little Shop of Horrors). On a December trip to Georgia to see my mom, I stopped at a rest area in the middle of nowhere in Alabama. (A good place for a rest area!) The three staff members—two women and a man—were all sitting inside behind the reception desk. When I came out of the restroom and was leaving, one of them said she had a question for me: was I a dentist? How odd, I thought, but I said no, I was a minister. Her smile and “I-told-you-so” glance at her co-worker indicated that she was pleased by the answer. “You just looked like you might be a dentist,” she said, and I took that to mean that I had a kind of professional bearing. Of course, I had no idea what qualities she actually associated with a dentist, and I didn’t hang around to ask. I had to get on the road. During the visit with my mom, a story came on TV about the shooter at Virginia Tech. “Such a nice looking boy,” my mother observed. I responded with a cliche: “You can’t judge a book by its cover.” But for her, someone who looked nice couldn’t possibly commit a crime. Presumably only shabby, ugly or dirty people do that. I shouldn’t and can’t be so hard on my mom, though. I judge people by how they look all the time. And, I suspect, so do you. I guess it’s the nature of the case. If we are just meeting someone and barely know their name, what else do we have to go on to make a judgment as to whether we would like to have the person as a friend, colleague or romantic partner? It’s like the old saw that a man’s shoes display his character. The way we present ourselves to others can speak volumes about our choices, our viewpoints, and our morality. But, as Shakespeare said, “the devil may assume a pleasing shape.” Not everyone who looks nice is a saint, and not everyone whose external appearance is off-putting is a sinner. Just think of all the men and women in 2008 and since wearing expensive clothes and watches and riding in fancy cars who plunged this country into its current economic crisis. Their well-kept appearance was no indicator of the state of their consciences and hearts. “[T]he Lord does not see as mortals see; they look on the outward appearance, but the Lord looks on the heart” (1 Samuel 16:7b). Last Friday, we began fostering a miniature dachshund named “Missy” for the local animal shelter. 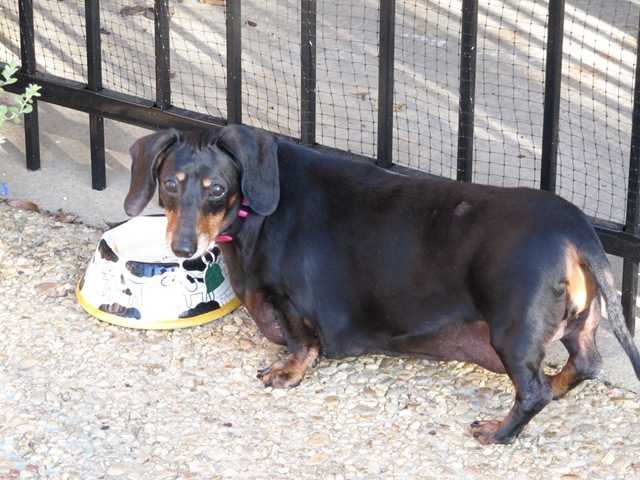 Missy is morbidly obese at 23 pounds (the proper weight for this breed is no more than 12). Her owner, who had to surrender her before going into a nursing home, had fed the dog bacon and eggs every day. We’re continuing the low-fat diet the shelter had her on, as well as making sure she gets plenty of exercise. The goal is to bring her weight down so she’ll be more readily adoptable. I found myself, to my shame, surprised when this fat little dog showed how smart she was and how quickly she could learn where the door was to go out or adapt to our routine. I told Susan that I realized she was fat, but not stupid. Did the two go together in my mind? I had to admit there was some lingering prejudice I had based on the way the dog looks, and also, on the way people look. Whatever my claim to the contrary or how loudly I preach against such an attitude, I still do judge by looks and externals. Missy has only been with us a week, but already caring for her has taught me a valuable lesson and made me come to terms with a part of myself and my upbringing I thought I had dealt with and moved beyond. Who knows what she will teach in the coming days? If you’re interested in Missy, please contact the Oktibbeha County Humane Society at 662.338.9093 or go to http://www.petfinder.com/petdetail/21064898.